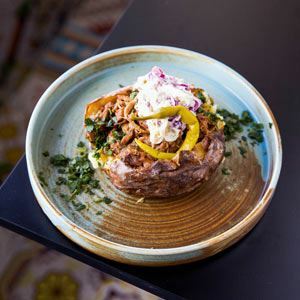 Indulge in exotic Lebanese cuisine overlooking Botany Bay at Atlantis on the Bay restaurant, located along The Grand Parade of Brighton Le Sands. Elegant pillars, sandstone features and high ceilings greet guests with an air of contemporary sophistication while wide windows provide plenty of natural light and a panorama over the coastline, well suited to intimate dining or for celebrating special occasions. 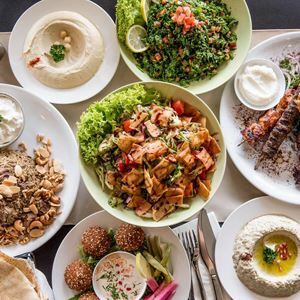 Browse over a vibrant, Lebanese inspired menu for lavish dishes like lamb Sambousek and succulent chicken Mansaf before beginning a feast of hot mezze plates like dolmades, dips and grilled haloumi. 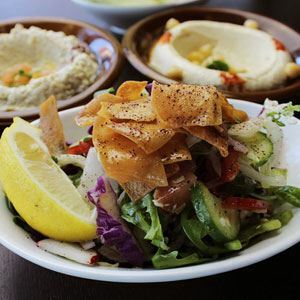 Main dishes may see tender meats marinated in garlic, lemon, oil and tantalising spices, or simply choose one of the banquet menus to taste a variety of popular Middle Eastern flavours. From the elegant tall pillars complementing the featured architraves and Mediterranean setting, and top level entertainment dance floor, your experience will be remembered with floor to ceiling windows overlooking beautiful Botany Bay. The freshly updated decor creates the perfect ambiance to enjoy Atlantis On The Bay’s signature dishes; Lamb Sambousek; Chicken Mansaf, Atlantis Mix Plate and other tantalising dishes. We can cater for up to 150 people for all types of events and functions.